We have an MBM Bus plying its route in town. 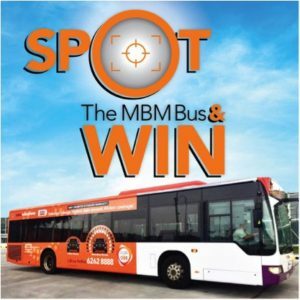 Take an interesting photo of the MBM Bus whenever you spot it on the road. Upload it to Facebook. Top 10 winning posts with most likes WIN! Each winner will get a $50 NTUC Voucher. Starts right now, last day for uploading your photo entry is 30 Nov 2017. Terms & conditions apply. Opening Hours: Monday to Friday • 9am to 6pm | Saturday • 9am to 1pmHotline: 6262 8888© 2017 MBM Wheelpower Pte. Ltd.